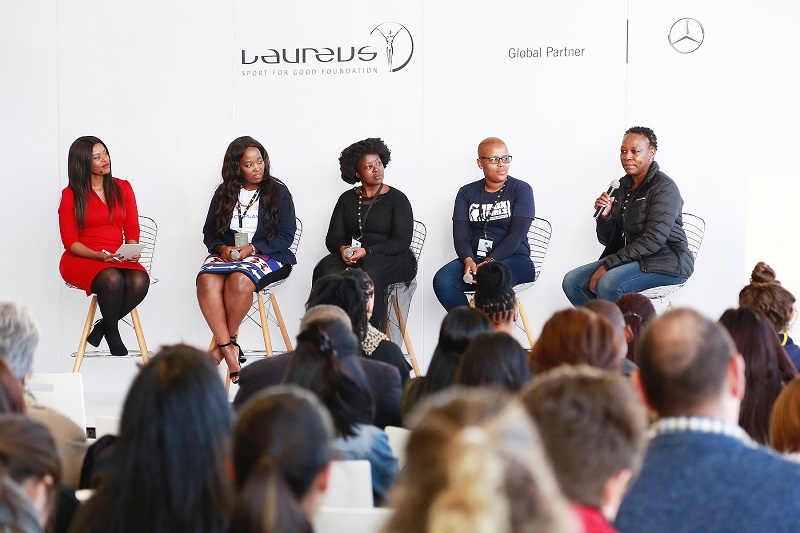 In honour of Women’s month, Mercedes-Benz South Africa (MBSA) and the Laureus Sport for Good Foundation South Africa hosted a breakfast featuring two women-only panels at its Mercedes-Benz Paarl Dealership recenlty. The morning was hosted by SuperSport’s Motshidisi Mohono and featured some highly respected female personalities in sport. The development panel included Laureus Trustee, Ntambi Ravele together with Executive Director of PeacePlayers South Africa and YES Programme Alumni, Nasiphi Khafu; CoolPlay Programme Representative and YES Programme protégé, Nokulunga Mvandaba; and Thembisa Ngamlana from Boxgirls SA, all representing their respective Laureus supported projects. The main panel comprised of three Laureus Ambassadors, former Banyana Banyana Captain, Amanda Dlamini; former SA Netball Captain, Zanele Mdodana; and SuperSport Women Sports Talk Presenter, Cynthia Tshaka, together with South African cricketer and rising star, Laura Wolvaardt. MBSA is a proud country patron of The Laureus Sport for Good Foundation in South Africa and the 25 community-based sports programmes that the Laureus Foundation supports in the country. The company also contributes to the Laureus Youth Empowerment through Sport (YES) programme as education and youth development is a central pillar in its Corporate Social Responsibility focus. The success of the YES programme is evident in the calibre of leaders, especially young women it has produced over the years. A number of powerful messages were shared during the morning, highlighting the incredible role that young women play in leading the way and breaking down social barriers. This year marks the 4th consecutive year of the annual breakfast series. MBSA, in partnership with Laureus, have thus far hosted a total of five sport-themed breakfasts at various Mercedes-Benz dealerships across the country. The sixth breakfast in the series which is scheduled to take place at the Mercedes-Benz East London Plant on the 5th of September will feature some of our country’s most extraordinary boxing talent. The breakfasts bring together seasoned sporting personalities who unpack the power of sport and its ability to create change in South Africa with a great emphasis on the astounding work that the Laureus Foundation undertakes globally. The Laureus Sport for Good Foundation funds, supports and promotes the use of sport as a tool for social change. The Foundation has a network of over 140 sport for social change organisations around the world using sport in innovative ways to tackle some of society’s most pressing challenges facing our youth. Since its inception, Laureus has raised over €100 million for projects which have helped to improve the lives of millions of young people. To further support the efforts of the Foundation, in 2017, Mercedes-Benz initiated a campaign to donate a percentage towards the Laureus Foundation with every purchase of a Mercedes-Benz passenger car vehicle. This initiative was rolled out globally and in South Africa, together with its dealer partners, Mercedes-Benz South Africa contributed an additional R1.78 million to the annual contribution that the company makes to the foundation.